MAGONIA REVIEW: GEF BEEN IN? Christopher Josiffe. Gef! The Strange Tale of an Extra-special Talking Mongoose. Strange Attractor Press, 2017. Near the beginning of this book one mystery is cleared up. Our hero’s name is pronounced with a soft ‘g’ - as ‘Jeff’, short for Geoffrey. Unfortunately this is about the only part of the mongoose mystery which we can solve conclusively, as everything else about the creature is entirely ambiguous, and all the more interesting for that. The basic story has been well-rehearsed. From 1931 until some time in the late 1930s, a mischievous apparition, usually claimed to be a mongoose, haunted a family living in a remote farmhouse on the Isle of Man. The creature described itself at various times as a 'spook', a spirit, a ferret, and the eighth wonder of the world. He engaged in a range of poltergeist-like activities such as throwing stones, moving and hiding domestic objects, and being responsible for a range of bangs and noises. But mostly he became famous for talking. The Isle of Man is an odd enough place already, with its rich mixture of Viking legend and Celtic mystery, and it's position equidistant from England, Scotland, Wales and Ireland. The Manx population is a sometimes fractious mixture of native Manx families and so-called 'comeovers', immigrants from the British mainland, many from the island's nearest big city, Liverpool. One such 'comeover' was James Irving from Wavertree, a small township just outside the Liverpool boundary at the time of his birth in 1873, but long since incorporated into the city. By the start of the twentieth century he was living with his wife and two children in a comfortable newly built home near the famous Penny Lane. He acted as a representative for a Canadian organ and piano manufacturers. This job ensured that they were prosperous enough to be able to employ a young woman as a domestic servant. Irving spoke several languages, including German and Yiddish, probably as a result of having customers and connections in Liverpool's Jewish community. However his business collapsed during World War I when huge tariffs were imposed on the importation of luxury goods like pianos. He attempted to set up an engineering business and tried to dabble in the property market, but with little success. His wife Margaret, whom he married in 1897, was from the Isle of Man and it may be that on a visit to the Island he learned of the property for sale at Doarlish Cashen, just a few miles from Margaret's parents home in Peel. His first intention seems to have been to use the property as an investment, rather than to live there. He saw himself as a 'gentleman farmer' employing farm-hands and having his son in charge of the day-to-day management. At first this seemed to work, but with the slump in farm prices after the end of the War, he soon found that he could not afford to employ outside hands and had to take over most of the work himself. The situation became worse when his son and older daughter tired of the remote life and left the farm, to start new lives elsewhere. There was now just Irving, his wife Margaret, and their younger daughter Voirrey (Manx for Mary), who was born in 1918. Now anyone who has read any psychological literature – and even the literature on UFO contactees and abductees – will recognise this as a classic case of 'status inconsistency', where an individual's perceived social position seems at odds with the realities of their current position. From being comparatively wealthy (his pre-WWI salary is estimated as being about £55,000 per annum in present-day terms) to being virtually a subsistence farmer in a remote part of a small, isolated island is a massive alteration of circumstances. And the changes were not just financial. In Liverpool he had been dealing with people who had both the money and the cultured tastes to buy expensive musical instruments for their homes. As we have seen from his knowledge of languages, often these customers were foreigners and presumably well-travelled. Now his social circle consisted of local farmers and labourers, many of whom would not even have left the Isle of Man, let alone travelled to Europe. He had belonged to a Masonic Lodge in Liverpool and perhaps in an attempt to mix with 'his own kind of people' he joined the Lodge in Peel, but as his income declined he had to give up even this connection to his old life. "The appearance of a strict Victorian matriarch who would seem more at home chastising the parlour-maid than feeding chickens"
The other two people in this story seemed equally out of place. Irving's wife Margaret had, from photographs, the appearance of a strict Victorian matriarch who would seem more at home chastising the parlour-maid than feeding chickens. A number of visitors remarked on her eyes: “her appearance, though strikingly handsome, is alarming. I have never before seen such eyes”, “her eyes are piercing and I have no doubt she could make her fortune as a palmist or soothsayer … Immediately I had the feeling She's a Witch”, “she is an aloof, peculiar woman”. Voirrey completed this out-of-place trio. In effect an only-child, both her older siblings having left the family, she was also an anomaly in this remote and rather primitive location. If we consider Gef to be a poltergeist, we are immediately looking for the unhappy adolescent daughter who is at the centre of the phenomena, and Voirrey fills this role perfectly. A bright, intelligent girl, clearly taking after both her parents, she stood out at school not just as a 'comeover' but regarded like her mother as a rather aloof character. 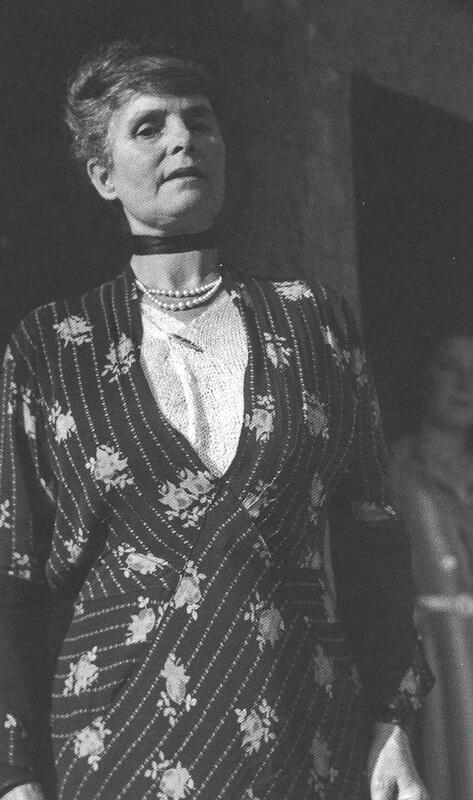 She was seen as “carrying herself a little above her neighbours”, although visitors reported also that she was a very practical person, who worked well on the farm, particularly looking after the animals. She also had a practical interest in machines and technology, which carried on into her adult career. So we have a family of three very 'status inconsistent' people living together in a tiny farmhouse on a little farm on a small island. And then Gef turns up. It's impossible at this remove to discern just exactly what the Gef phenomenon consisted of. There were mystery voices coming from gaps behind the panelled walls of the farm, stones thrown, and items misplaced and missing. Gef would sometimes abuse the family members and visitors. Personal abuse and offensive language is very often a feature of poltergeist cases, and is usually interpreted as the personality of the adolescent in the case expressing their anger and frustration at what they see as the repressed and controlled nature of their life. It is usually up to the taste of the investigator whether they feel this anger is expressed through a physical externalisation of the subject's emotions, or just through the medium of funny voices! If that is the case, then certainly Voirrey had plenty of reason to express that frustration. James was a controlling character who seems to have seen himself as the sole spokesman for the family. He would not allow visitors to speak to Voirrey away from his presence, and would usually take over the conversation anyway. There have been suggestions that he may have been sexually abusing the girl - largely based on the oddity that Voirrey's bedroom was locked from the outside – but Josiffe feels there is no evidence for this, and I agree with him. What the family thought Gef to be was never clear. At times they regarded him as an ordinary sort of mongoose which just happened to have leaned to talk, at other times he was a non-corporeal entity moving invisibly and soundlessly around the farms, but at times he seemed real enough to take James's fingers in his paws or give Margaret a painful nip. Apparently he wandered around the Island picking up gossip which he relayed to Voirrey, and making a nuisance of himself to the drivers and conductors at Peel bus garage. He seemed to be telepathic, telling her parents where Voirrey was on the farm and which animals she was dealing with. Unfortunately he seldom seemed to be around when there were visitors. Especially important visitors from the mainland. And this is where we seem to be able to discern the pattern of an explanation. From its origin in the autumn of 1931, the story of Gef began to spread like ripples from a stone in a pond. Rumours were passed around in the nearest villages to the Irving's farm, Dalby and Glenmaye, eventually to the town of Peel, where they began to be reported in the local papers,. 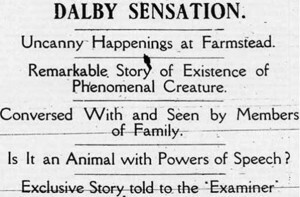 The Isle of Man Examiner reported it under the headline 'Dalby Sensation', describing the phenomenon as the 'Dalby Spook', the name it seemed to retain locally. The story spread to the mainland in the Manchester-based tabloid the Daily Dispatch, who sent a reporter to the Island. He announced that the 'weasel' amongst its other achievements, had given a tip for the Grand National. If many people had put their money on the 'weasel's' choice they would have been doing the bookies a favour! 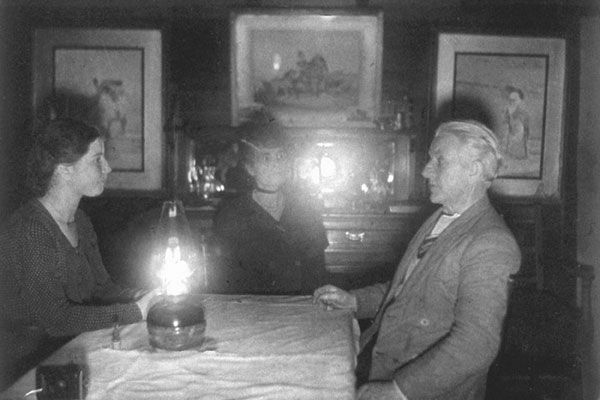 The story was now national and came to the attention of the famed psychic researcher Harry Price, who dispatched Harold Dennis, a Liverpool businessman, to do a preliminary investigation. Impressed by Dennis's account of Gef's antics, Price paid a visit to the Irving household. At this visit he asked Irving to keep an account of Gef's doings. And it is as a result of this request that Irving seems to have taken over control of the reporting of the phenomenon, keeping a detailed diary and becoming the Talking Mongoose's public voice. I think that what happened at this point is that James Irving realised, consciously or unconsciously, that here was a route out of his 'status inconsistency'. Price was a famous character, educated, a published author, broadcaster, with his own organisation, the National Laboratory for Psychical Research, and contacts with many important people. From now on the people who were talking about Gef were not Voirrey's taunting classmates, or the conductors at the bus garage, but men of education and status from London. People like Harry Price, Nandor Fodor the Hungarian parapsychologist and associate of Sigmund Freud, and the exotic Rollo Ahmed, friend of Aleister Crowley and author of the sensationalist 'exposé' The Black Art, who all visited the remote farm. In the later years of the phenomenon James Irving seems to have taken it over altogether, Voirrey expressing less and less interest as she grew to womanhood. Irving's diary and letters are the only source for most of the accounts of Gef's activities; the so-called physical phenomena are almost entirely in the words of Irving. At one point he placed a notice in the local newspapers to discourage sightseers and the idly curious from venturing to his remote home. Visitors were accepted only 'by appointment'. He didn't quite say 'no hoi-polloi', but the intention is clear. But increasingly, when those visitors 'by appointment' did turn up at the farm, Gef was noticeable by his absence. Instead of voices and stones, they just got James Irving's accounts of what had happened before they arrived. Eventually Gef just faded away. At 22, Voirrey moved from the farm to Douglas, the Island's capital, to work in an engineering firm, a position which seemed to suit her interests. James Irving died in 1945, his wife staying on for a few more years and eventually selling the farm and moving to live with relatives in Liverpool. Voirrey moved to the headquarters of the engineering company in Cheltenham, where she lived until her death in 2005. After leaving Man she gave only one brief interview to a writer for Fate magazine published in 1952 which seemed just to reinforce the ambiguity of the entire episode. "That ain't me, looks more like a llama"
So was Gef a ghost, a poltergeist, a hoax, a delusion, a folie-a-trois? The case is so complex, even in Josiffe's comprehensive and clearly-written account that it is impossible to come to any conclusion. For what it's worth I feel it started as a classic poltergeist case, with Voirrey using the peculiarities of the family home – the space behind the matchboard walls, the gaps in the stonework, the isolation – to produce Gef as an escape from the oppressive environment she found herself in. But as in many of these cases the original perpetrator loses control. Her father realises that Gef provides a re-introduction to the more cosmopolitan world he saw in his earlier experience. Perhaps Mrs Irving saw Gef and the distinguished visitors providing some level of status distinguishing herself from her neighbours. Just how much did she want to live up to the image of a 'witch'? Perhaps more than you might think, the Isle of Man has a reputation for such things, and Margaret was a native-born Manxwoman. Altogether I think they produced what was almost a collective imaginary friend, one who played a slightly different role for each of the participants, who used each other, and their visitors, fellow Islanders and even the idly curious to create their own Gef for their own ends. This is not quite correct. I am 81, and my Mother was a friend of Voirrey: my grandparents were friends of the Irvings. I recall having Sunday tea at Doarlish Cashen in the early forties (44)I recall pestering Voirrey to lure Geff out and would follow her about the outbuildings as she shouted and whistled (she was a great whistler) for Geff to appear (he didn't on the occasions I was there) Voirrey did not stay the rest of her life at Cheltenham, she moved about, living in bedsits in the Midlands area, and for for a time she returned to the Island, living in the Hamlet of Glenfaba, and later in a bedsit in Douglas. Throughout her life, she remained attractive and charismatic.